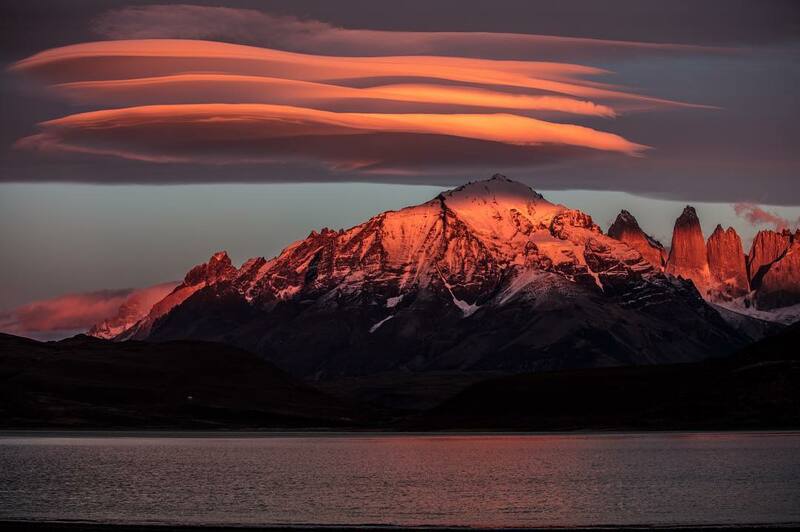 The best time to go to Chile is between September and November when temperatures are pleasantly cool in the North. Santiago and the Central Valley have mild winters and warm to hot summers so they are great places to visit all year round. Whenever and wherever you are in Chile you will notice there can be quite extreme changes in temperature from morning to night so layers are essential! Finally, the peak season for Easter Island is January to March although temperatures make it an option across the rest of the year. Further down south in Patagonia the weather is quite unpredictable and can be treacherous even in summer. The high season is January and February when the temperatures are a bit warmer. October, November, March, and April are cooler but less crowded of course. Finally, winter is not a great time to go and you will be limited in your potential activities. 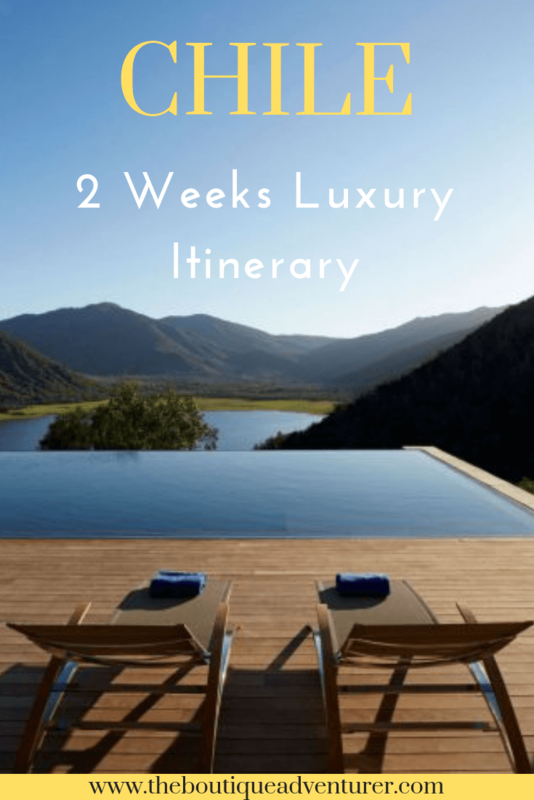 Another great place in South America is Colombia – check out my 2 Week Colombia Itinerary for Boutique Hotel Lovers. International flights into and out of Chile arrive in Santiago, Chile’s modern airport. 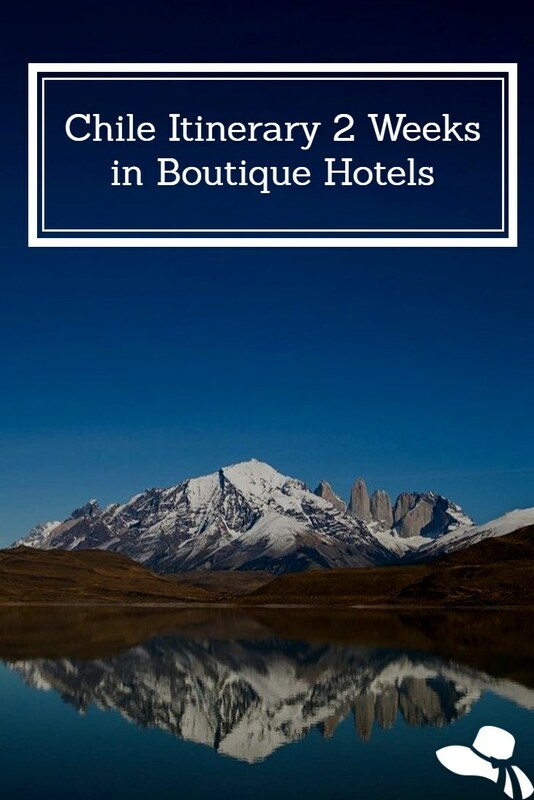 There are numerous flights to and from closer locations such as Lima and Buenos Aires daily. Despite Chile’s long skinny formation it is easy to get around the country when it comes to heading north and south. There are loads of good deals on local airlines to get you around efficiently. There are also loads of decent buses but of course, you need the time. 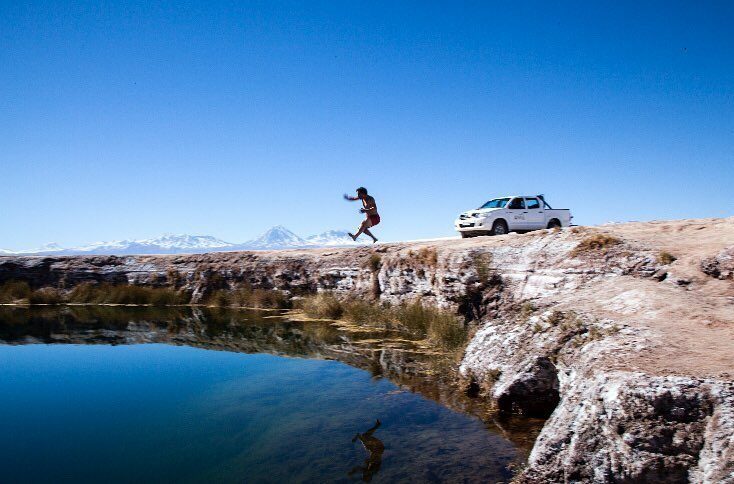 Car hire can also be a good option, especially for Patagonia. 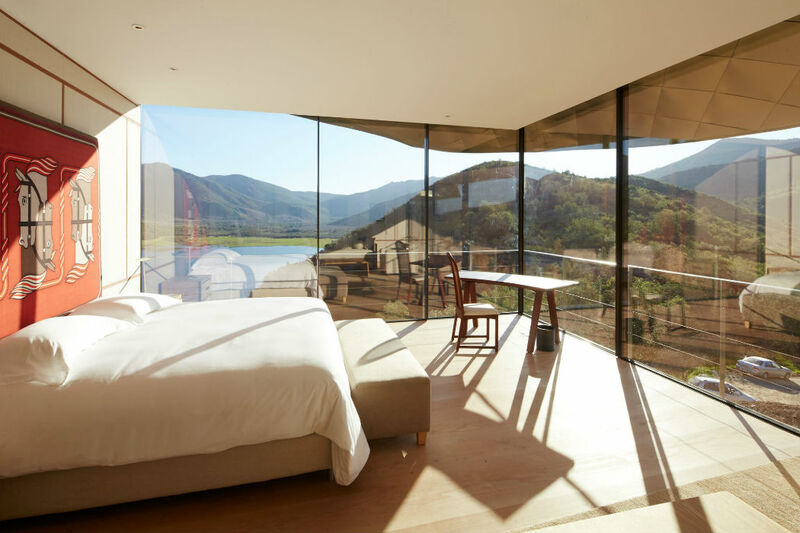 Arrive into Santiago and transfer to Vik Chile Millahue Valley – click here for Reviews for three nights. The stunning Millahue Valley is a two-hour transfer from Santiago. 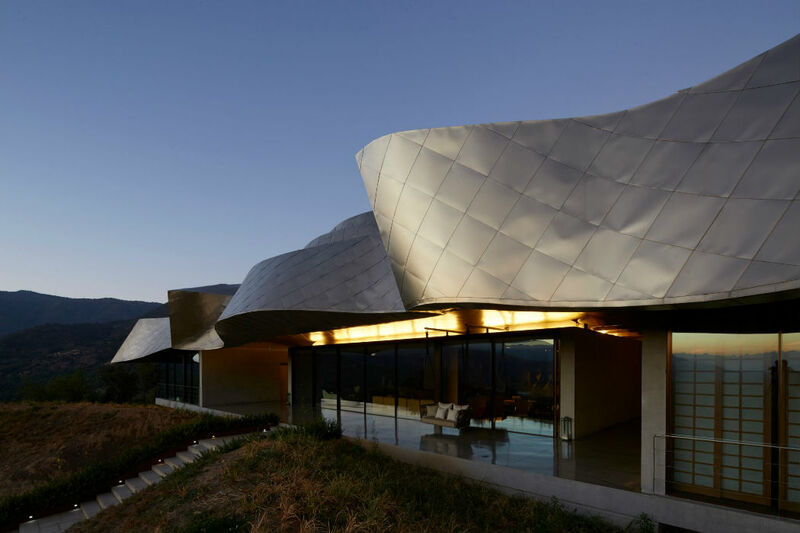 This wine region is bordered by the Andes mountains. 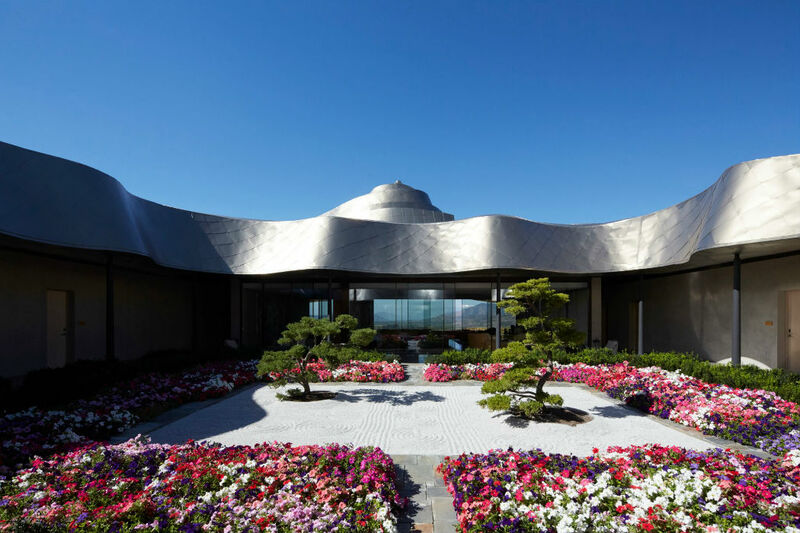 The stunning Vik hotel is a luxury boutique hotel designed for relaxing retreats. 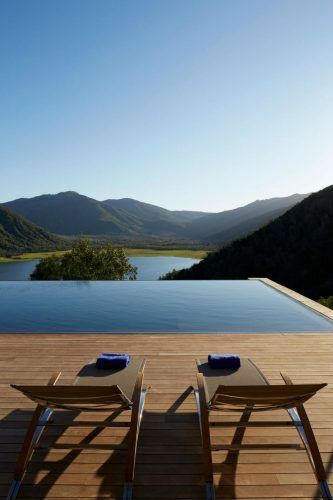 Floor to ceiling windows maximise the views of the stunning vineyards as does the infinity pool. 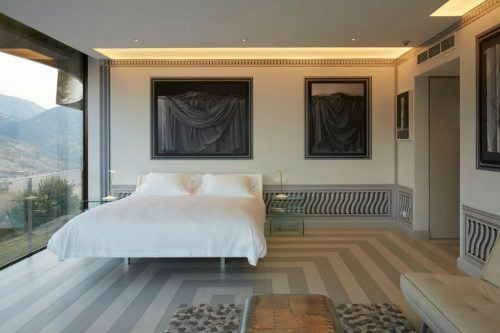 Staying at Vik Chile is a bit like staying at an art gallery – the hotel and its 22 rooms are filled with art. 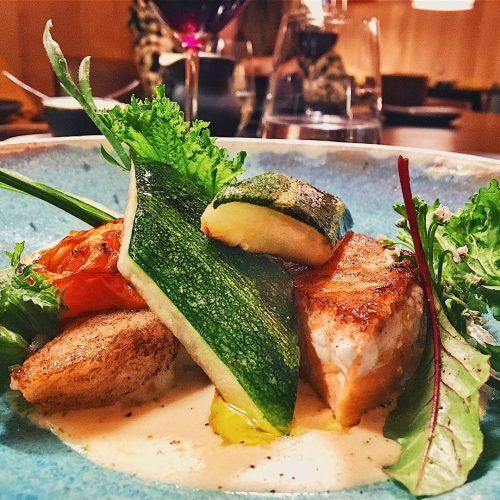 Dine at the stunning Milla Milla restaurant at the hotel and enjoy some barbequed seafood. Sit outside on the terrace if you can. After a fantastic breakfast at Milla Milla have a swim in the infinity pool and some relaxing time. Late morning it is time to start tasting some wine. 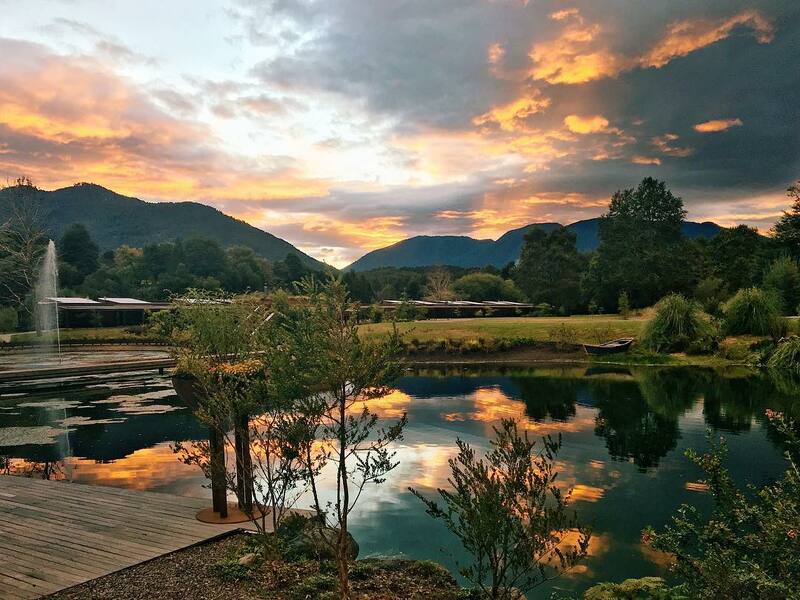 Head to Vik’s unique winery for a full tour to understand their unique winemaking process. Visit the agricultural backend and check out their ecological practices. Of course, the highlight is the tasting itself! Spend the afternoon tasting more Chilean wine at the hotel’s tasting hall. Let their wine expert guide you through the tasting and help you understand how to really taste wine. Have a late afternoon swim to sober up before heading for another delicious dinner at Milla Milla. Time to sweat out all that wine tasting from the day before with a morning of horseback riding throughout the valley. Depending on your energy levels the afternoon presents 3 great options. The highest energy is getting on one of the hotel’s mountain bikes and exploring. Next option is some valley trekking. For both of these options take a pre-prepared picnic pack. The final option is to head to the wonderfully named Wine Spa. 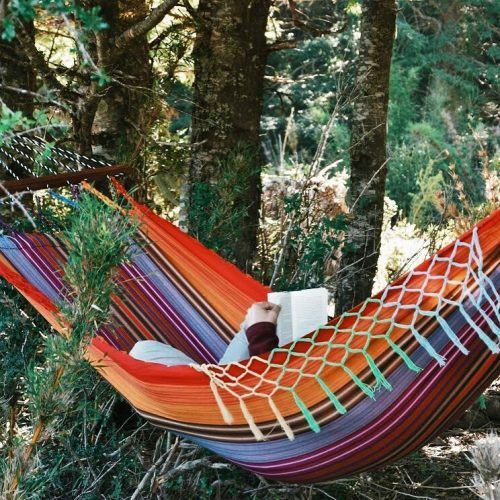 This can be all afternoon or post your activity. Enjoy wine in a whole new way by having grapes put on your face and body with one of their signature treatments. If you haven’t already make sure you try Vik’s signature red wine during your final dinner at Milla Milla. Ah, the amazing Atacama Desert! A landscape like no other! 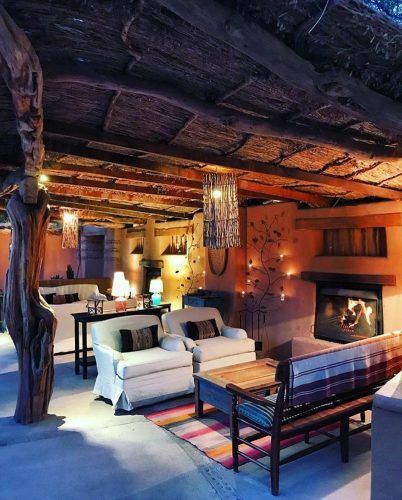 There is no better way to explore it than staying at the jaw-dropping Awasi Atacama. There are only 10 rooms and each is provided with a private guide and 4WD. 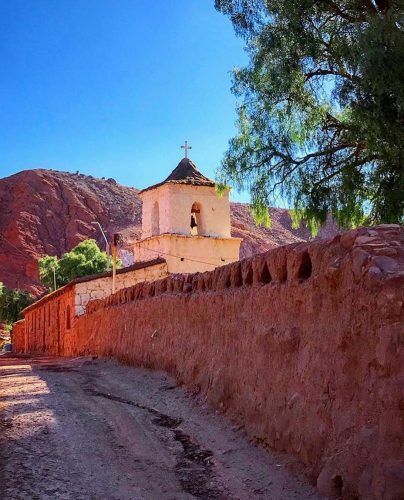 Explore the Atacama in your own way in your own time. Room costs are all inclusive as this is not an easy place to pop out to dinner. Make sure you enjoy a Pisco Sour after a day exploring and then try some of the carefully picked local wines. Try to get an early flight so you can do an afternoon excursion on your first day. Choose either a full day or two half day tours. 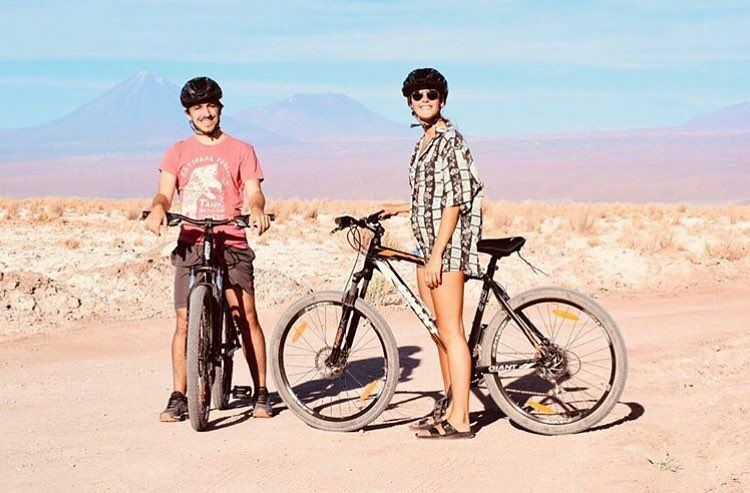 Just some of the amazing options available are the el Tatio geysers, an Astronomy tour, Salar de Atacama, the Altiplano Lagoons and many more options. Spend some time with your guide and plot our the perfect day for your interests. Fly from Calama to Temuco. Stay at Hotel Vira Vira – Click here for Reviews – for 3 nights. Hotel Vira Vira arranges transfers to the hotel, either by vehicle (90 mins) or helicopter (30 mins). 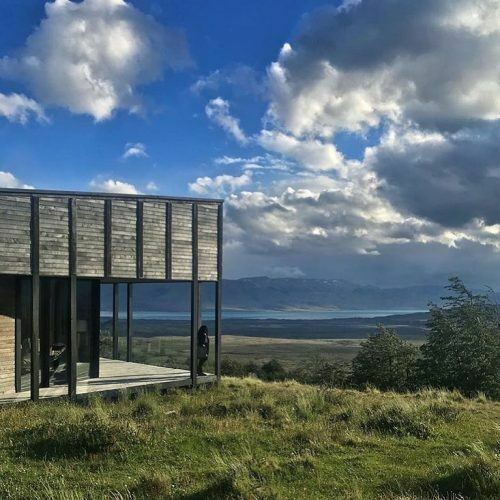 You can also connect via Puerto Montt Airport (3-hour transfer south through the Lake District) or cross the border into San Martin de Los Andes in Argentina. Click here for Latest Prices and Availability for Hotel Vira Vira. It’s been a busy week so far so have a bit more of a relaxing day today. Kick off with some yoga with a view. Then do a tour of the on-site dairy and farm. In the afternoon take a flight by either helicopter or small plane around the Villarrica Volcano. Finish off the day by visiting a Chilean rodeo. Time to get active! Choose from horseback riding, trekking or cycling on land. On the water choose between kayaking, white water rafting, fly fishing or sailing. 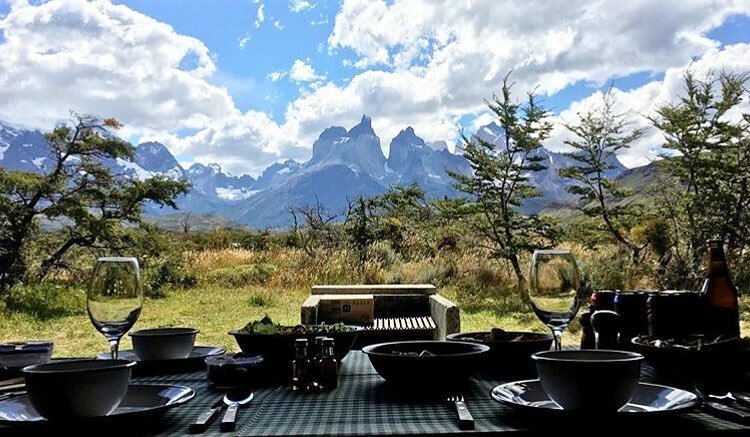 The Awasi resort is located in the stunning Torres Del Paine National Park. 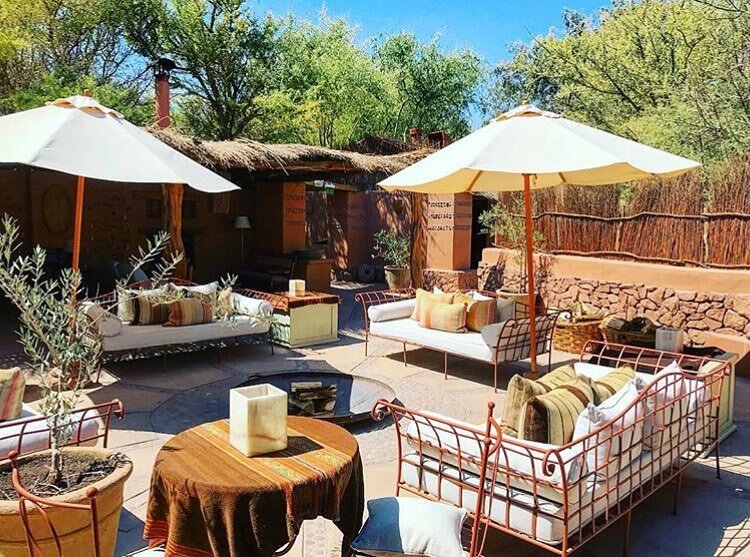 There are only 14 villas and like Atacama, each has its own private guide and 4WD. 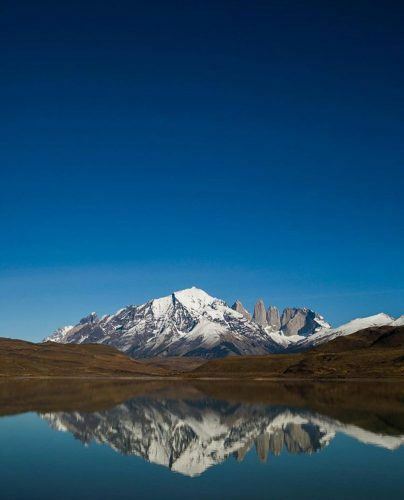 And each villa has a stunning view of Torres Del Paine. Your amazing dinner will come from locally sourced ingredients. If you can face it you can try the local lama guanaco! Explore the Awasi private reserve. You’ll see foxes, sheep, gauchos and much activity in the sky with eagles and condors. In the afternoon become a gaucho and take on some horseback riding. Trek to the base of Torres Del Paine. It will be a big physical effort but you will see some amazing scenery and experience fantastic views. Or head to Valle del Frances with its stunning glacier. For a stylish hideaway stay at The Singular Santiago for your last 2 nights in Chile. This hotel has every mod-con and a stunning rooftop pool. There is also a wellness spa if you’re looking to relax. If you have time take the classic sightseeing tour on the day you arrive. Click here for latest prices and availability for The Singular Santiago. Visit Valparaiso and Vina del Mar and take in a few wine tastings. Finish off an amazing trip with dinner at the stunning and sustainable Aqui Esta Coco. Fly Home. Alas, most flights tend to leave during the day so you will have minimal time to explore on this last day. To adjust the above from a 2-week itinerary to a 10-day option remove one day from each of the stays in all spots apart from Santiago. This will mean moving at a faster pace but will ensure that all of the major areas are covered during the visit. If you click through on the links that appear on my blog posts around flights, accommodation, tours, travel insurance etc. I get a small commission if you end up buying on these sites. Just wanted to make sure you knew!